The PBS television show “This Old House” has taken on plenty of seemingly impossible projects in its more than three-decadelong run. “Ask This Old House, a spin-off of the original Emmy Award-winning show, recently turned its attention to the West’s harsh drought conditions. Hardly an overnight or monthlong makeover project, the subject will be the focus for a segment that airs today in Southern Nevada. Photo by Koryne Smith Local landscaper Mat Baroudi showed the "Ask This Old House" team a recent backyard conversion, in which colorful groups of flowers were incorporated in the water-saving outdoor living space. 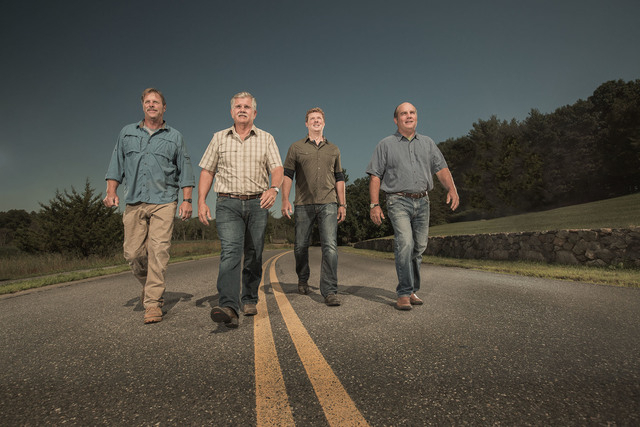 Courtesy Photo From left, "Ask This Old House" landscape contractor Roger Cook, general contractor Tim Silva, host Kevin O'Connor and plumbing and heating expert Richard Trethewey were in town to film an episode on the historic drought affecting the Southwest. In the episode, the experts make local house calls helping everyday homeowners tackle water-saving projects. 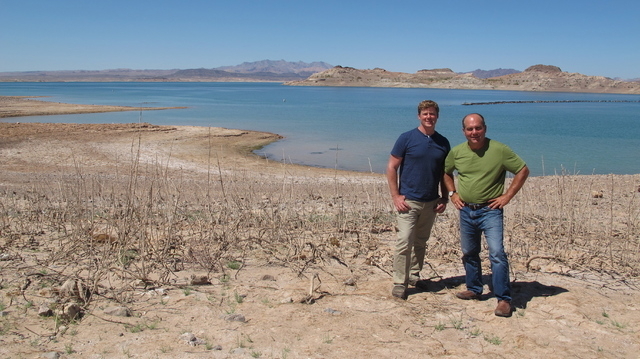 Courtesy photo "Ask This Old House" host Kevin O'Connor, left, and plumbing and heating expert Richard Trethewey were in Southern Nevada to film an episode of the historic drought. The pair visited Lake Mead to check out the low water level. 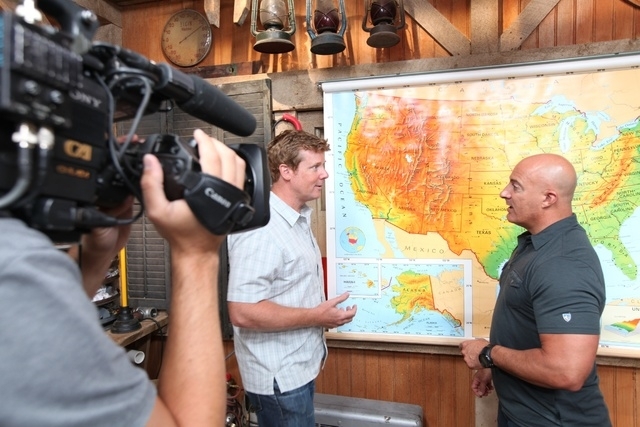 Courtesy photo "Ask This Old House" host Kevin O'Connor, left, met with Weather Channel meteorologist Jim Cantore to discuss America’s drought problem. “Ask This Old House” experts recently made their way to the Las Vegas Valley to film and learn more about our community’s water concerns. Producer Heath Racela, host Kevin O’Connor, plumbing and heating expert Richard Trethewey and landscape contractor Roger Cook shared some of the insights gained from visiting Southern Nevada and gave us a glimpse into the segment. The Southern Nevada Water Authority has been candid with locals about its position on grass. It is, hands down, the greatest water consumer in our city. Replace it with water-smart alternatives, and the water authority will offer a $1.50 a square-foot rebate, up to 5,000 square feet. All grass above that amount still brings a $1 per square foot rebate, too. The team at “Ask This Old House” sought out a local landscaping expert who could create a beautiful and functional space without grass. It found that in Mat Baroudi, owner of Las Vegas-based An English Gardener Landscaping. “We were drawn to him because he was such a big thinker. 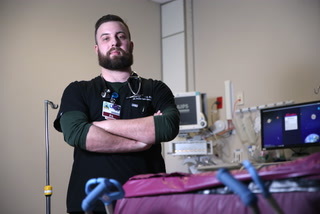 It’s his whole philosophy and how he puts plants where he does,” Racela said. From Baroudi, the “Ask This Old House” team learned just how beautiful and water-efficient a desert home’s landscaping can truly be. 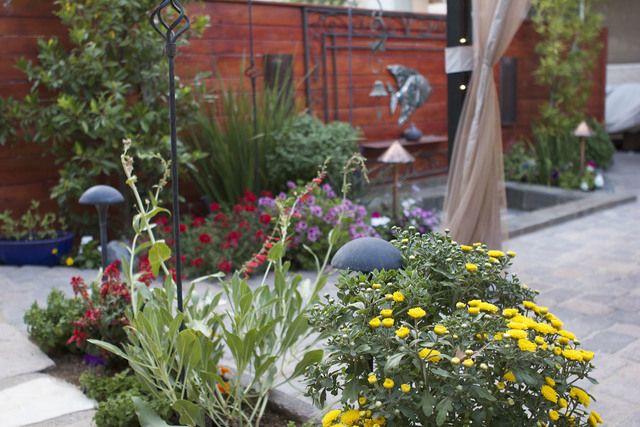 Baroudi uses hardscaping such as pavers and other materials to create walking or sitting areas, which can be accented by plenty of drought-friendly flowers and plants to give a lush look. In the episode, Cook and Baroudi help a Las Vegas resident remove a lawn that uses 28,000 gallons of water a year. Grass itself uses about 55 gallons a square foot annually, Racela said. The team’s landscaping approach involved creating clusters of annual and perennial plants and flowers. Yellow, orange and red zinnias can be planted near marigolds, geraniums and purple coneflowers to make an aesthetically pleasing and water-saving cluster. The green and purple of rosemary and iris also bring a great touch to a yard. Clusters of plants can also share an irrigation line, Racela said. The show also travels to San Francisco, where Trethewey helps one homeowner understand the value of replacing an old inefficient toilet. 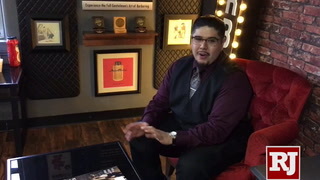 In the show, the expert makes a point to show a homeowner the difference between a toilet that uses 3.5 gallons per flush and an efficient unit that only uses 1 gallon by displaying actual gallon containers to the homeowner in the show. While in San Francisco, the team also took note of the city’s use of automated water meters. 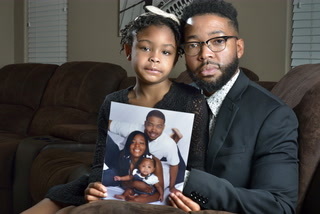 About 95 percent of the of the city’s homes now have them installed. The meters can communicate with both the homeowner and the city if water usage is becoming elevated in a home. “Up until this point, the water meter was only getting a reading every month. This is taking readings every single day. You can ask ‘why was mine so high? Oh, I did the laundry that day.’ … It is a way to watch your behavior,” Racela said. Trethewey also said when it comes to any water fixture, the EPA’s WaterSense logo is something to watch for. The expert explained the logo brings an independent certification for any water fixture with a proven 30 percent water savings or more. 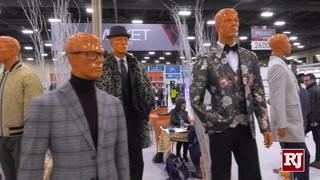 He also said the technology for water-saving shower heads and faucets has come a long way. O’Connor spent some time with Weather Channel meteorologist Jim Cantore, who offered a candid look into the water restrictions Southern Nevada faces. Cantore mentioned that Lake Mead, Southern Nevada’s primary water source, is 100 feet lower than it was in January 2000. “It’s an amazing visual to see how low it’s fallen,” said Trethewey, who toured the lake with O’Connor. Cantore explained how the low water level is largely the result of low snow pack from Colorado mountain ranges, not just a lack of rain. Water conservation measures have been a known local reality for some time. Community members have adjusted to scheduled watering days that shift by season and embraced the water authority’s incentives to get rid of traditional grass. Southern Nevada’s water consumption dropped nearly 29 billion gallons from 2002 to 2012, according to the water authority. Ironically, during that same time frame, the population increased by 400,000. Through its Water Resource Plan, the authority set a goal of 199 gallons per capita per day by 2035. With the help of its water conversation measures, it has already reduced that from 314 to 219 from 2002 to 2012. 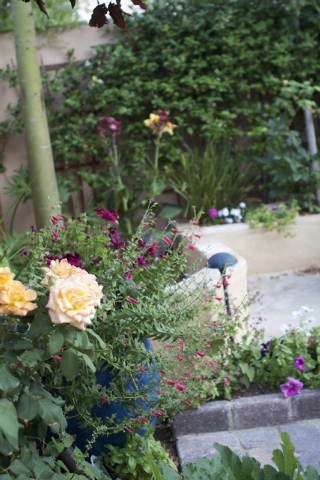 To learn more about water-saving landscaping strategies and the authority’s rebate programs, visit www.snwa.com.